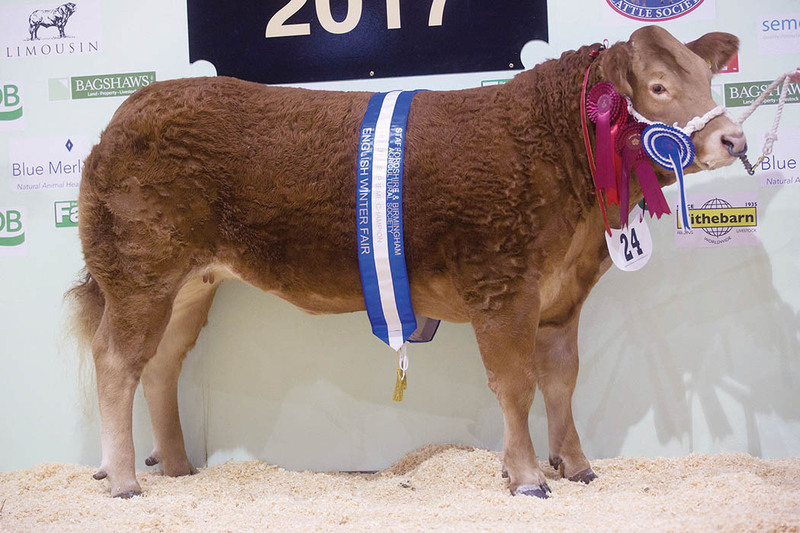 The overall cattle championship at the English Winter Fair was won by a Limousin cross heifer, Queen B, shown by the partnership of Edwards Brothers, Denbighshire, and J.M. Rowlands, Llanidloes. This heifer was bought at last year’s Welsh Winter Fair where it was runner-up in the baby beef judging. 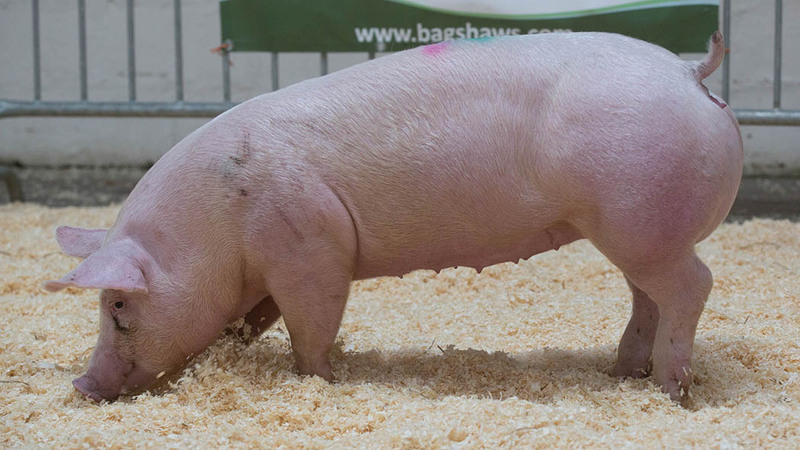 She was bred by Bowen and Bowen of Welshpool and is by Liscom Bigshow. In the post-show auction she went onto sell for £7,500. Reserve was the pedigree champion, Dolderwen Mercedes, from Phil and Sharon Sellers, Lincolnshire. This May 2016-born Lodge Hamlet daughter was bred by G. Jones and bought by the Sellers at the Brecon Show Potentials sale in February. 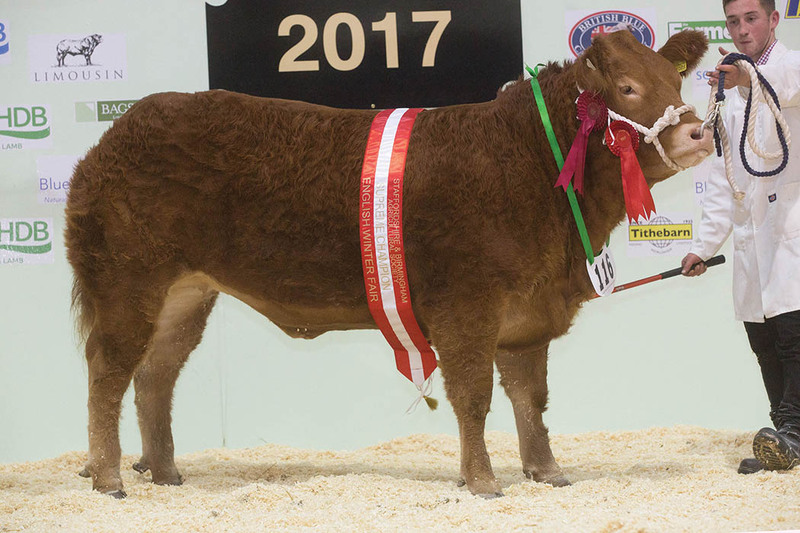 The baby beef section was won by a Limousin cross heifer, Babes, shown by W. Morgan, Powys. This April-born heifer was bred by G. Lewis and Messrs Davies of Welshpool, and bought out of a sale at Welshpool in May. She is also by Lodge Hamlet. Reserve was another Limousin cross heifer, Miss Lady G, shown by B.L. and J.E. Griffiths, Powys. This was also purchased from Welshpool as part of a cow and calf outfit. She is destined for the YFC classes at next week’s Welsh Winter Fair. 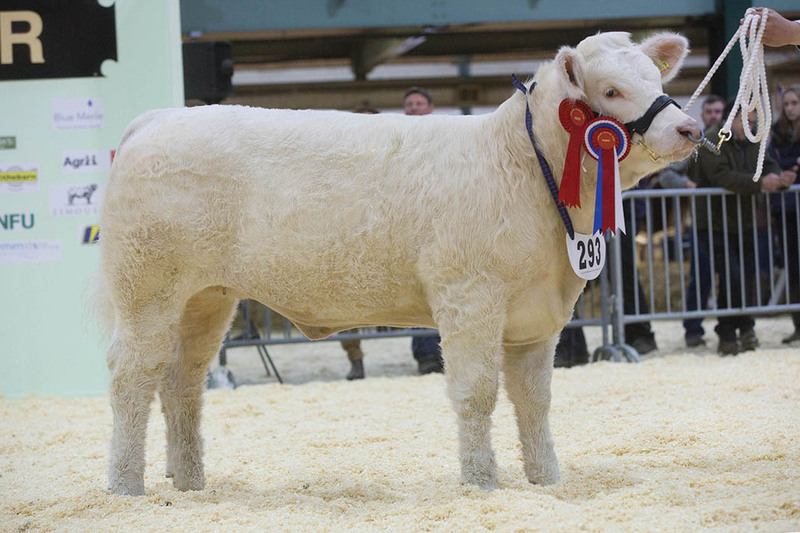 The national pedigree calf section was led by a March-born Charolais heifer, Balbithan Nabraska, shown by Thor Atkinson, Cumbria. This heifer was bought out of the Balbithan dispersal sale for 8,800gns at Sedgemoor last month. This Davally Illusion daughter will go onto be shown at summer shows next year. Runner-up was a British Blue heifer, Dinmore Moschino, bred by Paul Dawes, Hereford. This was the heifer’s first outing being shown by Mr Dawes’ stockman, Richard Bartle, and she is destined for next summer’s show circuit for new owner, Henry Jewitt of Show Winners, Co Durham. The sheep pairs was won by Robert Garth, Bentham, Yorkshire, with a pair of home-bred Beltex cross lambs, which went on to sell for the show judge Jonathan Maycock for £505 each. This was the second consecutive win for Mr Garth at the English Winter Fair. 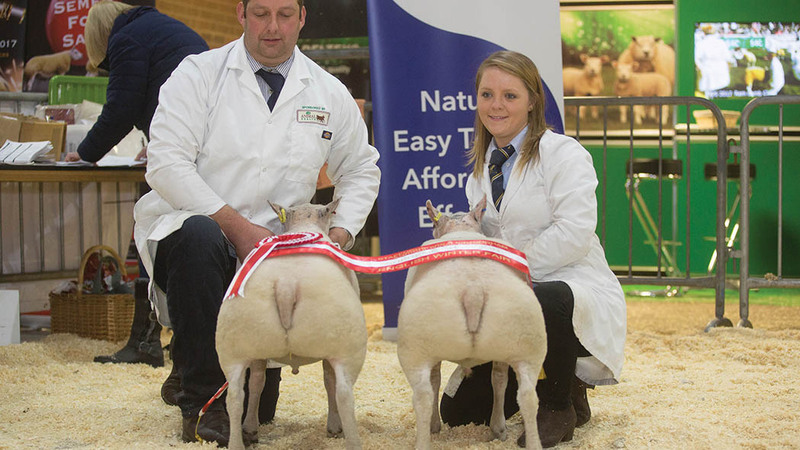 He has already triumphed this year at AgriExpo and AgriFest south West and AgriExpo with two different pairs of lambs. Reserve was a Beltex bred pair from Hywel and Enfys Williams, Llangadog, Carmarthenshire. These were bred by the Blandford Brothers and were bought privatelyin mid-August. They went onto sell for £650 to Mr Davis, mid-Wales. The pig judging was once again dominated by Mark Horsley from Skirpenbeck, York, who scooped the top prizes in the pairs, singles and also the pork carcase with Pietrain crosses. Mr Horsley, who was helped in the showring by his four-year-old son, James, has around 260 breeding sows which are all kept outside and finishes around 5,500 pigs each year. This was Mr Horsley’s sixth win, in both the live ring and carcase hall, in the last seven years at the event. The champion carcase went on to sell for 380p/kg to Lee Machin, Leek, and the live pairs at £200 each to Robert Bowring, Mansfield. In the cattle carcase judging it was first time lucky for Jonathan Lyon, Lincolnshire, whose British Blue cross steer was named champion, going on to sell at 440p/kg to Robert Bowring, Mansfield. The lamb carcase section was won by and B. Blandford and Sons, Hereford, with a Beltex which sold at 600p/kg to Lee Machin, Leek. Overall (Judges, W. Pickard, Leicester, and D. Thomas, Lampeter) Supreme, Edwards Bros and J.M. Rowlands, Queen B (Limousin cross); reserve, P. and S. Sellers (Limousin). Bred and fed (W. Pickard and D. Thomas) Sup., T.A. and L.C. Lyon and Son, Beau (Limousin cross); res., P. Price, Maximus (Limousin cross). Native pedigree (W. Pickard and D. Thomas) Sup., T.D. and W.T. Livesey, Normanton 1 Pacific (Hereford); res., D. Plested, Crystal Hazel (Lincoln Red). Pedigree (W. Pickard and D. Thomas) Sup., P. and S. Sellers, Dolderwen Mercedes (Limousin); res., I.J. Phillips, Cowin Miky (Limousin). Cross-bred (W. Pickard and D. Thomas) Sup. and heifer, Edwards Bros and J.M. Rowlands, Queen B (Limousin cross); res. and steer, M. and S. Harryman, Jimmy (Limousin cross); res. heifer, M. Morris, Fiona (Limousin cross); res. steer, L. Calcraft, Highland Lad (Limousin cross). Baby beef (J. Courts, Yorkshire) Sup. and heifer, W. Morgan, Babes (Limousin cross); res. and res. heifer, B.L. and J.E. Griffiths, Miss Lady G (Limousin cross); steer, F. Page, Harry Mallinder (British Blue cross); res. steer, N.E. Slack, Mane (Limousin cross). Pedigree calves (P. Gentry, Newark) Sup., T. Atkinson, Balbithan Nabraska (Charolais); res., P.R. Dawes, Dinmore Moschino (British Blue). Pairs (J. Maycock, Derby) Sup., R. Garth (Beltex cross); res., H. and E. Williams (Beltex cross). Pairs (M. Carter, Lutterworth) Sup., M. Horsley (Pietrain cross); res., S. and E. Ashcroft (Welsh). Singles (M. Carter) Sup. and res., M. Horsley (Pietrain cross). Beef (J. Temple, Sutton Coldfield) Sup., T.A. and L.C. Lyon and Son; res., F. Page. Lamb (J. Temple) Sup., B. Blandford and Sons (Beltex); res., G. Weaver (Beltex). Pork (J. Temple) Sup., M. Horsley; res., J.A. Evans-Baskerville.